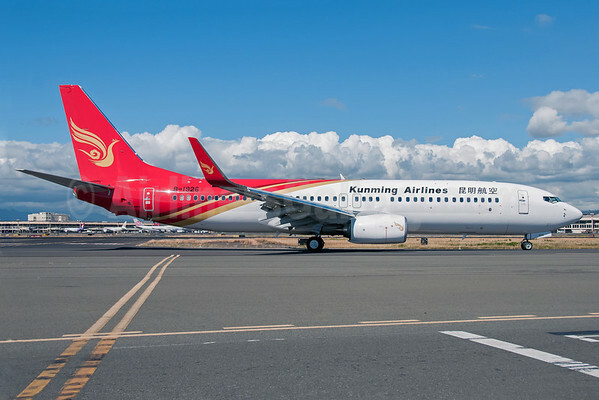 Kunming Airlines (Changshui) has committed to purchase 10 Boeing 737s, including four Next-Generation 737-700s and six 737 MAX airplanes. The commitment, valued at $897 million at current list prices, is subject to the approval of the Chinese government and will be posted on Boeing’s Orders & Deliveries website once all contingencies are cleared. Kunming Airlines, based at Changshui International Airport in the capital city of Yunnan province, began operations in 2009. The carrier currently serves more than 25 cities across China by operating a fleet of 10 Boeing 737-700s and five 737-800s. Copyright Photo: Ivan K. Nishimura/AirlinersGallery.com. The larger Boeing 737-87L B-1926 (msn 41111) taxies at Honolulu. This entry was posted in Kunming Airlines and tagged 737, 737 MAX, 737-700, Boeing, Boeing 737, Boeing 737 MAX 8, Boeing 737-700, Changshui, Changshui International Airport, Kunming Airlines on October 23, 2014 by Bruce Drum.